‘Hippitots aims to provide affordable high quality care and education tailored to meet each child’s individual needs. We operate in a modern early years setting with traditional values delivering peace of mind to parents. We encourage children to explore the world by providing opportunities to stimulate interest and imagination through play and other learning’. 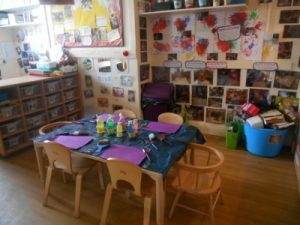 The facility had its last OFSTED inspection in October 2009 and the conclusions of the Inspectors that it was ‘Good’ and ‘Provision is Strong’. View Hippitots Childrens World’s latest Ofsted Report. Durham County Council’s Environmental Health Assessment awarded the centre 5 stars showing very high standards of compliance with food regulations. This is the highest award for food safety management in the whole of Coxhoe. There is a variety of sessions available including school runs and 15 hours a week free for 3 and 4 year olds. For further details contact the centre.